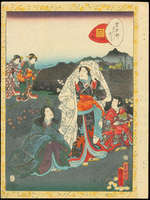 The Tale of Genji is thought to be the world’s oldest novel. 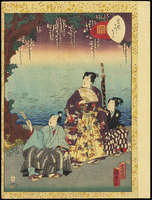 It was written by Murasaki Shikibu, a woman from the Heian period (11th century Japan), and chronicles the life and romances of Prince Genji. 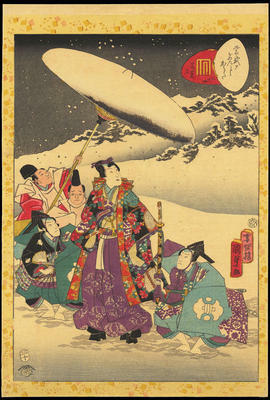 This series - Murasaki Shikibu Genji Karuta - is considered to be the best works by Kunisada 2. The series was designed and printed around 1857. Apparently the publisher Tsutaya Kichizo used the highest quality papers and inks for this special Genji series. 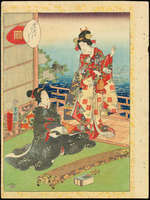 Each print is identified by the “Genji mon” and title that are located in a unique cartouche in the shape of an opened clamshell. Each scene is surrounded by a beautiful speckled gold-coloured margin.